The 2013 SLX group looks great and it is nearly as brilliant on the technical side as XT, while sporting features recently exclusive to XTR. We expect to see SLX on performance bikes priced in the $3000 range. 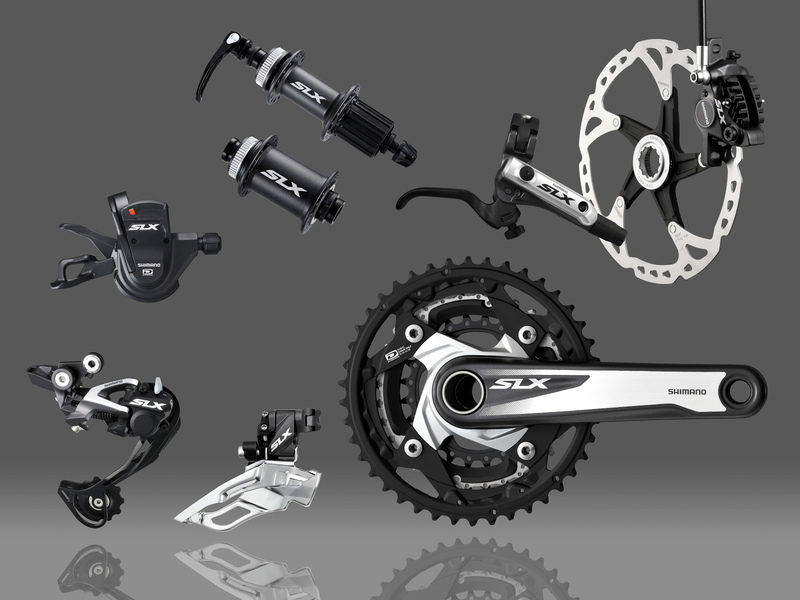 The 2013 SLX group's low-geared 38 x 24 two-by crankset is good news for long-travel trail riders and 29ers. Two-by options are 38 x 24, 38 x 26 and 40 x 28. Shimano's DynaSys close-ratio 42,32,24 triple (inset on lower right) is its default crankset. 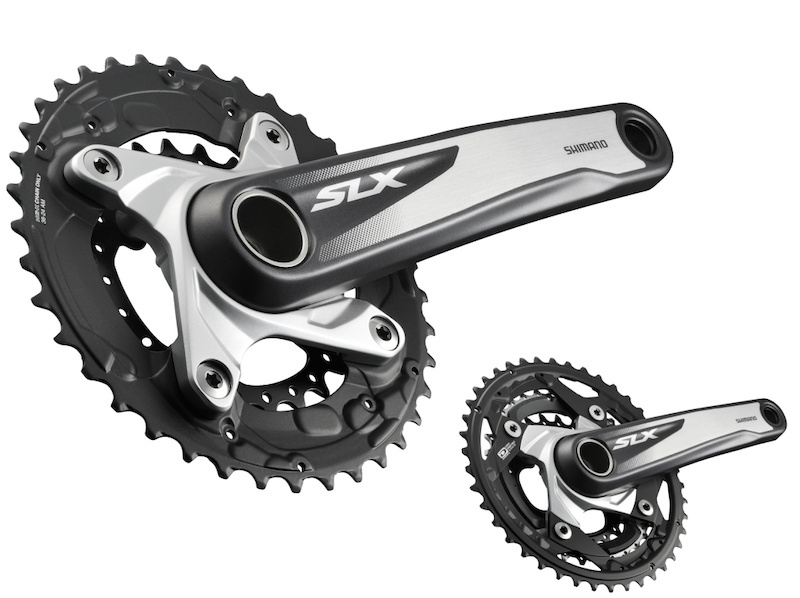 A closer look at the SLX crankset indicates the two-by version (left) has a different spider than the triple crankset on the right. Torx hardware indicates that SLX chainring bolts may be aluminum. 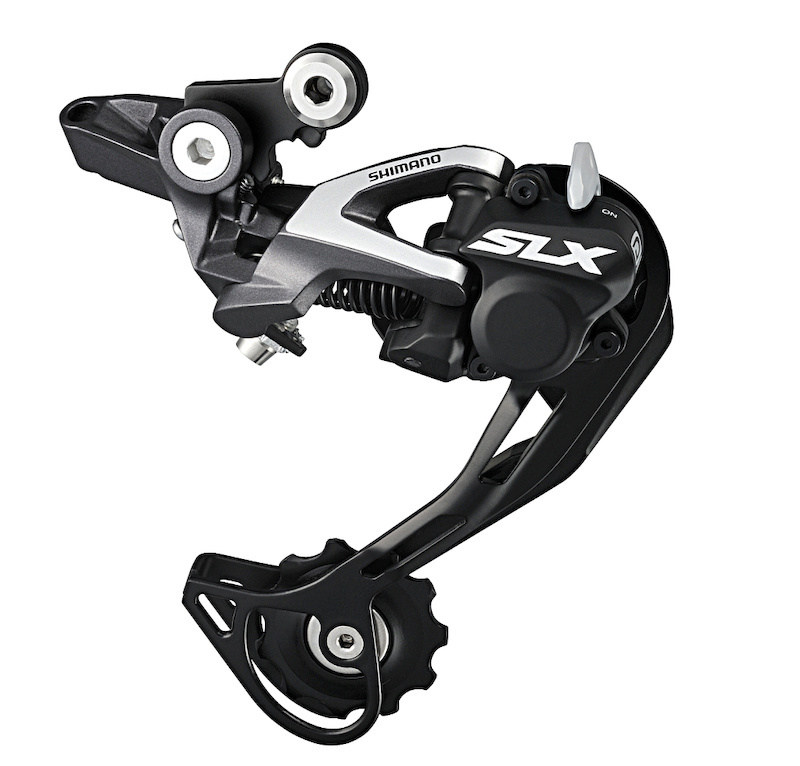 The on/off lever at the cage pivot housing shouts that SLX rear derailleurs get the Shadow Plus friction clutch that was only released to XTR a year earlier. Insiders say that the clutch design is a simpler, sturdier second-gen version. The SGS long-cage version is shown here. Shimano also offers a medium-cage GS derailleur for its two-by drivetrains. A 'Non-Plus' rear derailleur is also available. 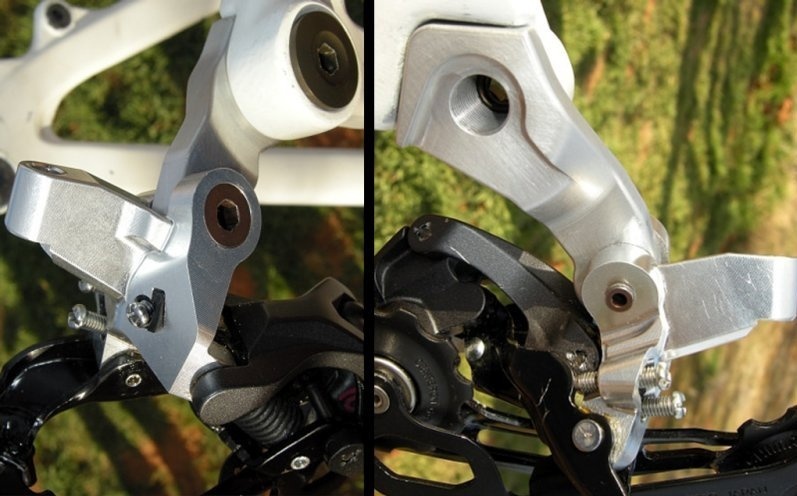 Both feature Shimano's new 'Direct Mount' hanger (not shown), which replaces the short pivot arm above the derailleur body, as well as the frame's derailleur hanger. A look at the prototype Direct Mount rear derailleur setup reveals that Shimano is anticipating widespread use of through-axle rear wheels. The Direct Mount link is an adaptation designed primarily for through-axle 29er frames (although it can easily be adapted to a standard dropout) and is an option with all 2013 Shadow rear derailleurs. It replaces two flimsy pieces with one direct connection between the frame and derailleur pivot. 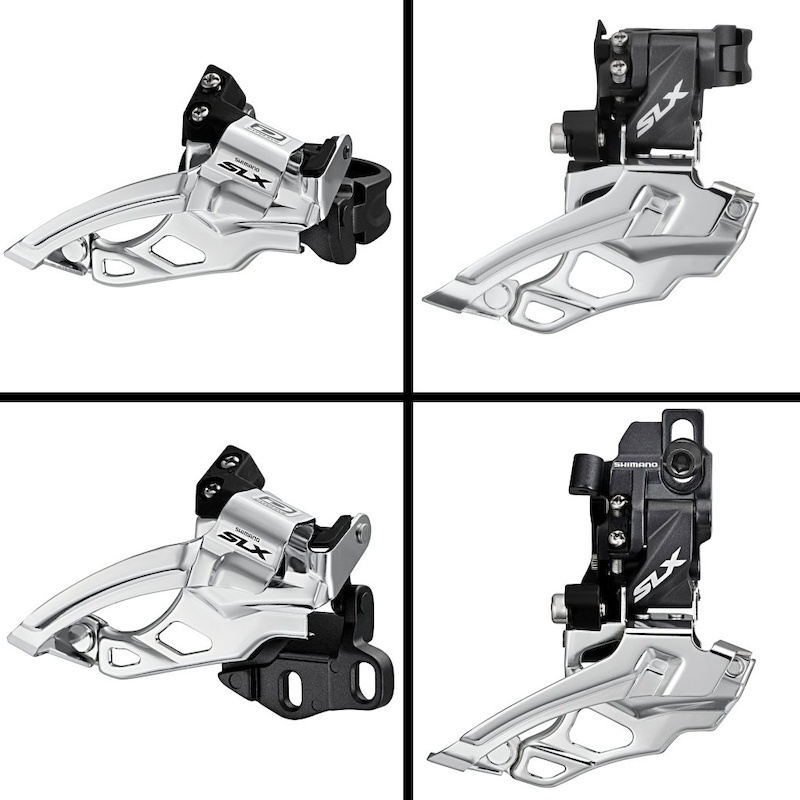 Shimano simplified its derailleur offerings with four SLX models: two clamp types (high and low mount) and a high and low-mount version that bolt directly to the frame. The cage has been redesigned for rear suspension to shift the chain as it passes through a wider arc. The rear-facing bits of the SLX front changers have been narrowed to clear 29er tires and suspension linkage. SLX shift levers look and feel better. Left-side shifters also get the two-by/three-by mode-change switch that was once exclusive to XTR and XT. The shifter on the left is the ISPEC integrated clamp design, while the one on the right features the optional indicator and standard handlebar-clamp mount. 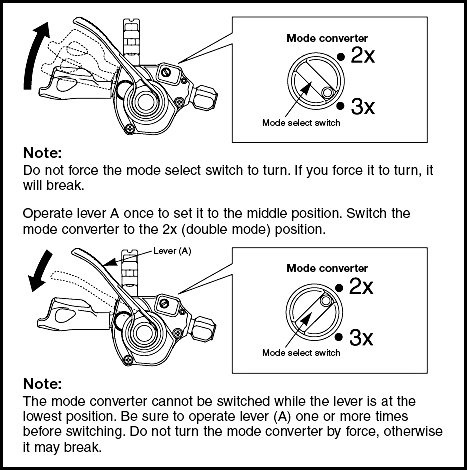 In case you didn't know about or understand the mode switch on the left-side shift lever, we stole this illustration from Shimano's XTR instructional PDF. The small cam limits the standard three-position shift action to shift only two chainrings. It is a sweet feature should you decide to switch cranksets later. 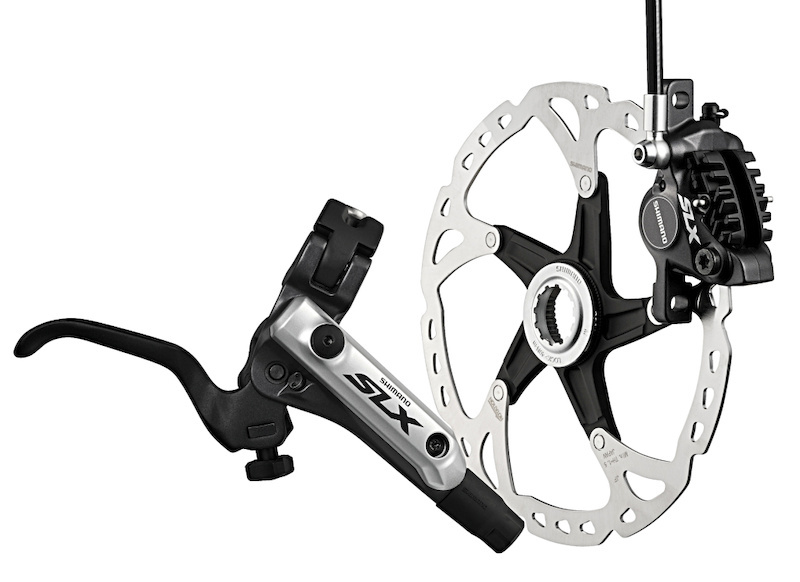 SLX brakes are big news. Ice Tech XTR and XT has gained traction among the best rider in the sport as the best of the best. SLX shares the ceramic pistons, finned pads and aluminum-sandwich rotors below, and the crisp-feeling Servo Wave action shorty brake lever design above. 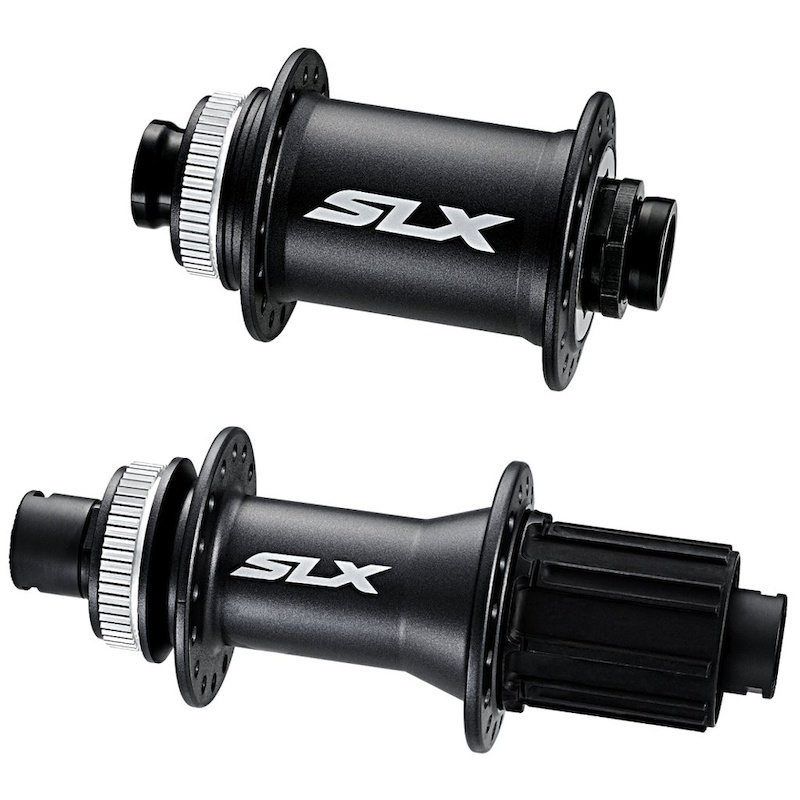 SLX hubs use adjustable angular-contact bearings and are available in standard quick release or with through-axles (15QR front and 142/12-millimeter rear) SLX hubs feature Centerlock rotor interfaces. Six-bolt SLX Ice Tech rotors are also available for alternative hubs. 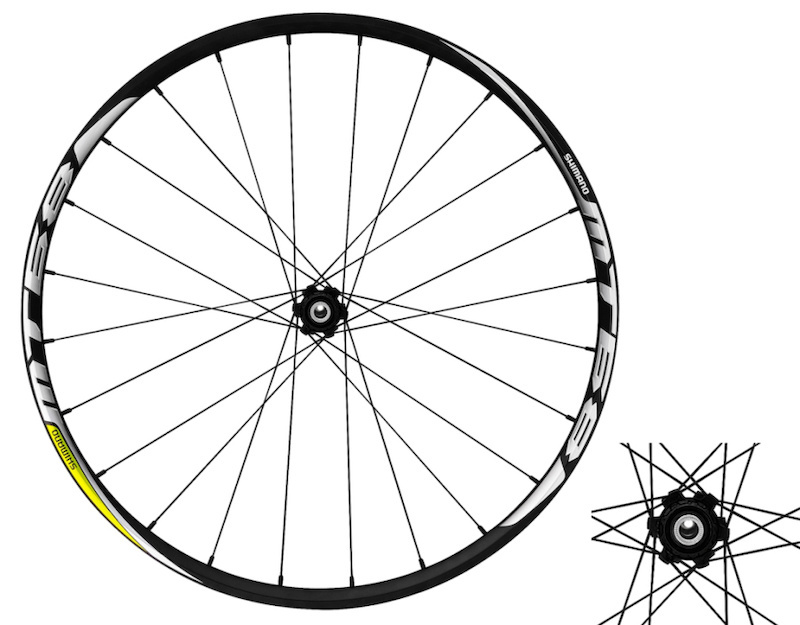 Not known for its fancy names, Shimano's latest 26-inch AM/trail wheelset is called the MT68. The '68 rim is a 21-millimeter ID profile - plenty wide to support 2.35-inch tires - and it is a true UST tubeless design, so mounting tires will be a snap.Shimano said that they will be hitting the LBS in July 2012. Shimano eludes that its MT66 series wheels are for XC racing, but when have they ever built a product that couldn't stand up to punishment? 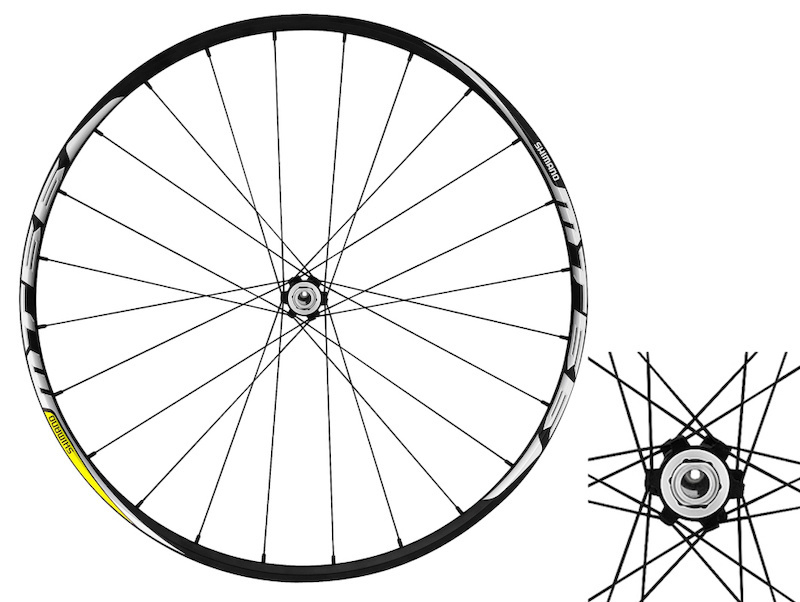 MT66 wheelsets are available in 26 or 29 inch sizes (29er is shown) for riders who want a lighter weight wheel and ride tires under 2.2 inches wide. Shimano developed its own tubeless system for the '66, and it's UST certified. Wszystko super, ale po co przechodzą na torxy? By klientom, co sobie kupili ampule nie było zbyt łatwo w życiu? Niby tak, ale w takim razie totalnie bez sensu jest zostawianie niektórych śrub na imbusach. Jak zmieniać standard to po całości, a nie że połowa imbusy, a połowa torxy. Że nie wspomnę o tym iż cykliści, co właśnie wydali 50+ PLN na scyzoryki z imbusikami na pewno docenią jakąkolwiek zmianę standardu ;-) Scyzoryków z torxami to chyba nawet nie robią, więc miłośników wożenia narzędzi czeka spora zagwostka jak ten problem obejść. Nie tylko. Przyjrzyj się np hamulcom. Poza tym chodzi o zasadę. Będąc pro (jestem pro? nigdy nie startowałem w zawodach, ale blaty zdarzyło mi się wymieniać), też nie chciałbym MUSIEĆ kupować kompletu nowych narzędzi, ani wozić na zawody zarówno dodatkowego kompletu torxów. To nie o to chodzi, że to jest poza zasięgiem ludzi, by to kupić i mieć. Tylko o to, że to dodatkowe, całkowicie zbędne, komplikowanie życia ludziom! Na ten przykład: Do niedawna 97% rzeczy w moim rowerze mogłem zrobić kluczem imbusowym 3, 5, płaskim 10 i 13 i tylko te klucze woziłem (a i to nie zawsze). Na nowym osprzęcie jadąc na wyprawę możliwe, że będę musiał dorzucić dodatkowe 3 klucze torx, bez których do tej pory świetnie sobie radziłem zarówno ja, jak i producent osprzętu. Po prostu nie czuję w jaki sposób moje życie miałoby się stać od tego lepsze. Plus: spróbuj wydrapać błoto z torxa. Przy imbusie to proste, a przy torxie i jego zakamarkach to może być zabawa na dłużej. Wszystko super, ale po co przechodzą na torxy? Śruby i tak można sobie wymienić.